ROSSIYSKAYA GAZETA writes under the headline ‘George Bush called to order’ that the EU’s Jose Manuel Barroso and French President Nicolas Sarkozy suggested to the U.S. president at his residence in Camp David that the time is ripe for a new global financial order. The paper says it is already clear that after the current crisis the world has to change drastically and U.S. unilateral attempts at curing the crisis are doomed. 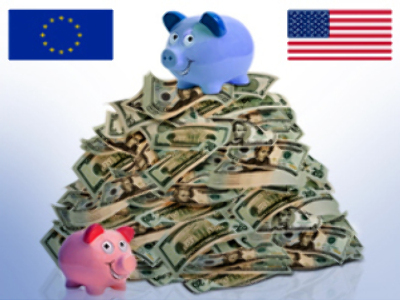 The European offer, says the newspaper, actually means that a meeting of world leaders to be hosted but not presided over by the US, will most probably put an end to the financial system that has been in existence for over 60 years. NOVAYA GAZETA says that the financial crisis made everyone so busy at the EU summit in Brussels that there was no time left to discuss Russia and the aftermath of the Georgia – South Ossetia conflict. European leaders, writes the paper, one after another spoke of change and reform. The most energetic of all was the president of France Nicolas Sarkozy, who wants a totally new ‘market socially-oriented model of capitalism’. The same paper remembers how 35 years ago the ‘Judgement Day War’, which pitted Israel against Egypt and Syria, opened up the market for Soviet crude oil. Arab nations announced an oil embargo for U.S. allies, writes the paper, and European countries had to turn to Russia for their fuel. TRUD writes that help in fighting the financial crisis may unexpectedly come to Russia from the same source: if OPEC member nations, most of them Middle Eastern, decide to decrease their oil output by the end of this week, it will help keep the price of Russian crude oil within acceptable limits. IZVESTIA has an opinion piece by Dmitry Voskoboinikov who writes that the lack of Christian morality in the modern world is such that the current financial crisis may, in fact, be God’s punishment for the extremes of consumerism. The writer says that it is in America, where the majority of the population believes in God and lives accordingly, that morals are most twisted. Paradoxically, it is America – or the corporate part of it together with Hollywood – that is generating the global impulse that turns sin into virtue among the corporate elite and other social groups. As a result, says the author, greed is disguised as competitiveness, unstoppable lust is treated as a behavioural problem and gluttony becomes a medical condition – where the average restaurant portion in America has grown by 30 % in the past twenty years, and is still growing. KOMMERSANT has a column by Fedor Lukianov, the Chief Editor of the magazine Russia in Global Affairs, who writes that Russia needs to follow the example of the U.S. by making a long-term investment in its allies. He says the fact that America still maintains huge influence around the world, even with its current erroneous foreign policy, can only be explained by America’s financial backing of its allies that has been going on for decades. Lukianov says Russia should start doing the same in respect of its post-Soviet partners and neighbours. It is clear, he says, that nobody will ever stand for Russia’s interest as strongly as Russia itself. Every nation, however close an ally, holds its own interest in a higher esteem than that of any other. What a long-term investment policy can do, he continues, is to create common agendas when an ally would be pursuing its own interest, and in the process assisting the fulfillment of Russia’s interest as well.